Chocolate ice cream, pistachio ice cream or any ice cream with nuts has always been my favorite. I stopped buying pistachio ice cream because I was disappointed after trying a variety of brands. It’s not the same as the ones which we get in India. Finally I found that the Indian grocery stores carry it (at least here in Canada) in small tubs which tasted exactly like the one I used to have in India. 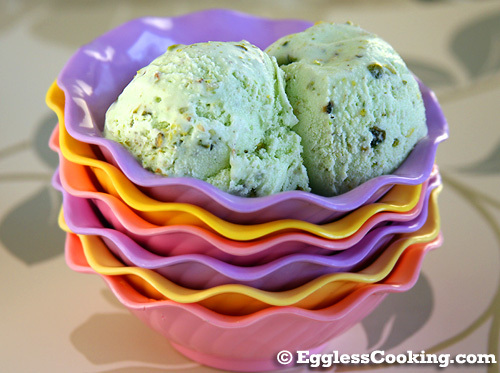 Ever since I have wondered how to make pistachio ice cream at home? I didn’t have an ice cream maker then and had always thought that making homemade pistachio ice-cream, or any other ice cream for that matter was not possible without an ice cream maker. That thought changed when I tried the eggless banana ice cream at home without an ice cream maker. It was easy to make it and tasted awesome too. 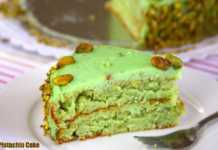 But still I was hesitant to make pistachio cream at home without an ice cream maker. So just kept postponing that thought. 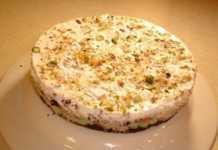 Years passed and my husband gifted me an ice cream maker for one of my birthdays and with so much love for pistachio ice cream I was ecstatic when I saw a simple recipe for eggless, homemade pistachio ice cream in the book which came with my Cuisinart ice cream maker. The summer I got the machine we were moving from US to Canada, so I didn’t even open the package it came in. Then there was settling in the new place and within a couple of weeks I went to India. When we were back in September my son started going to school full time and he started having a lot of sinus/cold issues so I kept postponing it again and again but finally the mango ice cream recipe in my mango desserts list gave me the nudge to use the machine. I tried the mango ice cream recipe with fresh mangoes which was just awesome. I couldn’t believe that making ice cream at home with a machine could be so easy. The recipe book has a couple of eggless ice cream recipes including vanilla, chocolate, strawberry to name a few. But with my love for the Indian style pista ice cream, I just wanted to try that first and couldn’t have been more happy with that decision because the eggless pistachio ice cream I made was AWESOME, DELICIOUS and DECADENT! I know that I’m going to make this again and again and get rave reviews from everybody. I think much of the flavor for the pista ice cream came from the pista milk essence I used. I don’t know how many of you have heard about this. This essence comes in a small plastic container. You just add a couple of drops of it and sugar to the milk for pistachio flavored milk. Similarly you can make almond flavored milk and rose milk too. I got these from India but I’m sure that you should be able to find it in the Indian grocery stores here too. Try your luck! I’m pretty sure that you can make this easy pistachio ice cream recipe at home without an ice cream maker following the banana ice cream procedure. 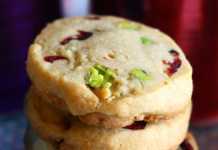 In a medium mixing bowl combine together all the ingredients except the pistachios and pour into the freezer bowl and follow the manufacturer’s directions to make the ice cream. Mine took about 25 minutes to thicken. Add the pistachios then and let the machine run for another 5 minutes. If you desire a firmer consistency, transfer the ice cream to an airtight container and store in the freezer for two or more hours. 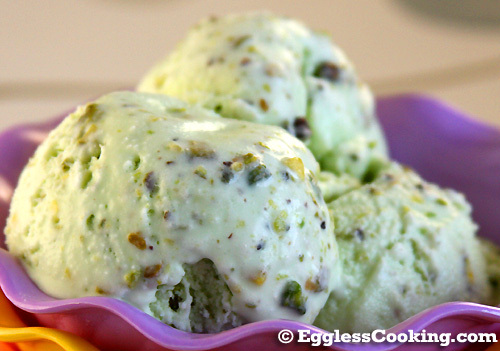 I couldn’t believe that I made this pistachio ice cream at home. It was AWESOME! But I have to warn that the taste is so addictive that you can’t stop with just a little. I used little more than 1 cup of sugar. Maybe about 2 tablespoons extra. I usually do this with frozen desserts because once frozen the dessert tends to taste less sweeter. I used the pistachio milk essence you can find in Indian grocery stores. This definitely gave a rich pistachio flavor to the ice cream which I have tasted back in India. You should be fine, Swathi. You might have to do some changes with the other ingredients. Thanks for the marvelous posting! I seriously enjoyed recipe . Hey our names are same & choice of ice cream too. You mentioned in the recipee “follow the manufacturer’s directions to make the ice cream.” Will you please tell me procedure details here? I would love to try it.. Btw thanx for the post , it was pretty useful. Is there no need to add cmc and gms powder? What are these? I haven’t used either in the recipe. that sounds so good!Perfect! Simple recipes are BEST! Can you please say,how much pistachio essence has to be put in,if using? 2-3 drops should be enough. you have taken me into a flash back.. love it! !